As Quartzelec gears up to celebrate 20-years of operation at its Aberdeen repair, maintenance, overhaul and re‑certification workshop, it’s also expanding the facilities to better service customer requirements. Quartzelec is today a leading international and independent engineering service provider; but in late 1998, GEC Alsthom as the company was then, took the decision to set up a winding and electrical repair shop to service the growing needs of Shell’s North Sea oil platforms; and hasn’t looked back since. Twenty years on, the Quartzelec Aberdeen business has proven itself in its field of expertise; with a particular focus on supporting rotating machines deployed in the marine and North Sea sectors. Paul Oliver was recently recruited to the position of General Manager, following Jamie Burns being promoted to a regional director role. Now employing 38 people, three of the original five person team involved in the original business set-up are still employed at the York Street location. The men responsible for laying down the foundations of this thriving Aberdeen business – Dave Murray and Bill Peace are both now enjoying retirement, but were instrumental in the successful growth and will very much be an integral part of the 20-year celebrations planned for later in the year. 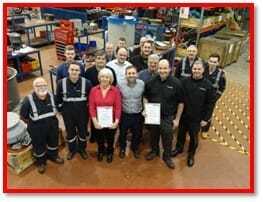 In addition to an active facility upgrade programme at all locations it operates, Quartzelec also invests heavily in ongoing staff training, including at its thriving Aberdeen workshop, to ensure compliance requirements are maintained and that it has qualified engineers to deliver and meet customer project needs. Whilst some storage is available at the Aberdeen workshop, not having been built with this purpose in mind, space has always been at a premium, so a dedicated machine storage facility has just been opened at the city’s Welling Trade Park, just five minutes’ from the existing facility. The 500m² unit provides not only secure, temperature and pest-controlled storage, but facilities for HV and LV machine maintenance, supplies for winding heaters, a 5T forklift plus additional customer meeting rooms. From a customer perspective the new facility provides the reassurance that their rotating assets are stored correctly and at a cost-effective price; and is all just part of the Aberdeen service. Back in 2016, as part of a wider corporate development initiative, Quartzelec also invested £100,000+ into the Aberdeen workshop to upgrade the electrical test and maintenance capabilities. A key part of this was the addition of the ability to put almost 300kW of load through a motor/generator and test full line voltage of up to 3.3kV. Specific upgrades included significantly increasing the size and load bearing strength of its embedded test plate so that larger machines can be accommodated. The electrical analysis and test systems were also uprated along with the safety systems and protocols to provide improved staff protection. Quartzelec is also fast becoming known in the sector for the LIFEVIEW® a fully flexible and modular condition monitoring solution that’s increasingly being used to evaluate and monitor the health of rotating electrical assets. Used to identify possible deteriorating and excessive wear that could then result in equipment failure, it is a key component in reducing total cost ownership over the lifetime of a machine and an integral element of any structured maintenance and repair. The Aberdeen team was also instrumental in spearheading the development of the latest Quartzteq LIFEVIEW PDAII, a second-generation portable device that helps keep capital expenditure to a minimum with sensors remaining in-situ; a solution that’s now being adopted by many of its offshore clients.